The year 2016 saw more than the usual share of challenges. Cyclical and disease-induced downturns in agriculture, the damage from Hurricane Earl, and the harmful effects of de-risking by international correspondent banks, combined to trigger a mild economic recession. As well, there was the final settlement for the nationalization of BTL. The Arbitration Award was large, though much smaller than the previous owners of the company had demanded. And fully, sixty percent of it was a consequence of the previous Administration's odious Accommodation Agreement. Still the overall size of the payout resulted in stretching the limits of the public debt. To make up, however, there has been BTL's breakout performance service wise and revenue wise since nationalization; and there is also its superior future growth trajectory. Together these factors wholly vindicate a Belizean ownership that is now 'feeling the rush'. In fact, these make the Award a price well worth paying for an asset that is now a source of great pride and profit. Socially, there was the prolonged BNTU strike which kept our children out of their classrooms for eleven days. It additionally had the consequence of draining away confidence from the relationship between Government and a key social partner. Thus, 2016 in many ways tested our resolve. But 2016 also brought measurable advances. Government's national infrastructure renewal proceeded without pause, and saw completion of a number of multimillion dollar sporting and community projects in San Pedro, Dangriga and Punta Gorda. There were also large continuing investments in sugar roads, the PGIA to Belize City portion of the Philip Goldson Highway, the Mountain Pine Ridge Road, the Hummingbird, and the 17 million dollar expansion to the Sir Barry Bowen Municipal Airport. Several notable private sector developments also took place in 2016. These include the opening of the $100 million Harvest Caye facility, with initial wrinkles having now been sorted out so as to guarantee a stake for Independence, Placencia, Monkey River and villages in Toledo. Those private sector developments also include: the $22 million additions to the PGIA, the multimillion dollar renovations to shrimp farms in Southern Belize, the new Santander sugar processing factory, some 800 new hotel rooms and direct airline service between Canada and Belize. But what perhaps should bring us greatest 2016 pleasure is a recent independent assessment by UNICEF of the quality of life in Belize. Their survey showed that 96% of Belizean households had access to better drinking water, 92% to electricity supply and 87% to improved sanitation services. Hence, more than 9 in 10 of citizens polled expressed a high level of life satisfaction; and fully three quarters of our young population aged 15 to 24 felt that their lives had improved over the past year. So, ultimately, 2016 was in fact a year which illustrated the truism that things are never other than a mix: good with bad, progress with problems, advances with setbacks. But whenever the balance goes more to the minus side, I assure you that we will be Churchillian in our optimism that we can make opportunities out of difficulties. Thus it is that we march into 2017 certain that the next 12 months will produce a full national recovery. First, the Central Bank of Belize expects an economy-wide expansion of 3.5%, driven by dramatic growth in tourism and services and a robust recovery in farmed shrimp, corn and bananas. Second, our public servants, teachers, soldiers, nurses and police officers will receive a 3% salary increase with interest. This is the final Collective Bargaining Agreement remuneration installment and, together with increments, will total an unprecedented 23% global raise over four years. Third, Government expects to improve the state of public finances and public debt by amending the currently unaffordable terms of our inherited Super Bond. The overhaul will also involve the implementation, after broad consultations, of a Budget for fiscal year 2017-2018 that cuts spending and boosts revenue. There is fat to be trimmed and there is money to be collected. But this will be done without weakening our pro-poor programs and without sacrificing investments in education, health and security. Accordingly, there will be no diminution in either Food Pantry or BOOST, and in fact the 2017 start to Southside Poverty Alleviation Phase 3 will bring additional relief to targeted communities. Likewise, two polyclinics and three health centers for Corozal and Cayo will all be completed in the coming year. And the IDB-funded Education Quality Improvement Project will see the building of dozens of new classrooms in the rural areas. Contributing to the economic rebound forecast by the Central Bank, will be the massive five year, 400 million dollar capital investment program of the public utilities BTL, BEL and BWSL. Another big driver is the menu of Central Government and Private Sector projects either in the planning or early implementation stages. These include, but are not limited to: the Caracol Road; the link road and bridge joining the Philip Goldson and George Price Highways; the new Haulover Bridge and the multi-lane expansion of the carriage way between the PGIA and Belize City; the bulk cargo and cruise port in Belize City; the Coastal Road; the Belmopan to Benque rehabilitation; and the new Macal River bridge that is a feat of local engineering. In the all-important tourism sector there are the new airline routes to come from Fort Lauderdale and Denver, plus the already-commenced Tropic Air flights to Merida, Cancun, Chetumal and parts of Central America. A direct Mexico City to Belize connection via a Mexican carrier is also being worked on for 2017. To host this passenger increase, there is a frenzy of hotel construction in North Ambergris Caye, Caye Caulker and Placencia. Blackadore Caye has also broken ground, and Caye Chapel's owners expect their 200 million US dollar partnership with a five star brand to be announced by February. All this infrastructure and tourism activity plus the agricultural export resurgence will, we are sure, see a return to the historic employment highs Government achieved in 2015. Underpinning our entire economic, fiscal and monetary framework is the strength of the Belize dollar. It is still more than amply backed by the requisite level of reserves, and is immovably anchored to the traditional and current peg. There is also social reform to accompany economic reform. The Integrity Commission has been appointed, the UN Anti-Corruption Convention signed, and the commencement date fixed for the 13th Senator Law. The Occupation and Safety Health Bill will shortly go to Parliament, as will amendments to the Social Security Act providing expanded benefits to all workers in the country. We have as well sorted out the interpretation of a section of the Law so as to ensure proper coverage of stevedores who don't work continuously. I want to close by saying just a bit about National Security. We have provided both the BDF and the Coast Guard with much additional material, including helicopters, seagoing craft and weaponry. The police are also far better resourced and we have grown their numbers exponentially. Increased funding for our men and women in uniform will continue under CABEI's Belize Integral Security Program, reaching 10 million dollars next year and 38 million in 2018. We are determined, therefore, to resist external dangers and defeat internal threats. There is no room for lawlessness in our society. And so the bringing of economic and social progress to our people has to be accompanied by relentlessly confronting the culture of gangs, violence and murder. 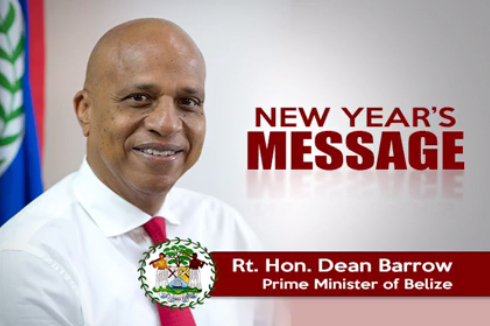 In all respects, then, 2017 must be a turnaround stanza as we seek to fulfill the promise of our annual greeting: Happy New Year and God bless Belize.